Plano, IL (January 29, 2018) – Ice fishing participation is definitely on the rise. 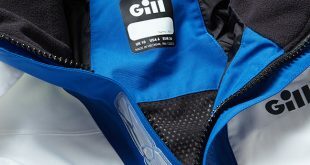 With unprecedented equipment options and safety in mind – including USCG-rated flotation suits such as Frabill’s I-Series – an ever-increasing number of anglers are going where they didn’t go before. That’s because whether you’re after a true trophy or just looking for a tasty meal, ice fishing is a lot of fun. While some ice anglers are content to flop down on a 6-gallon Sit-N-Fish and pull ‘gills from a single hole, many anglers have committed the same amount of time, effort and investment to their hardwater game. 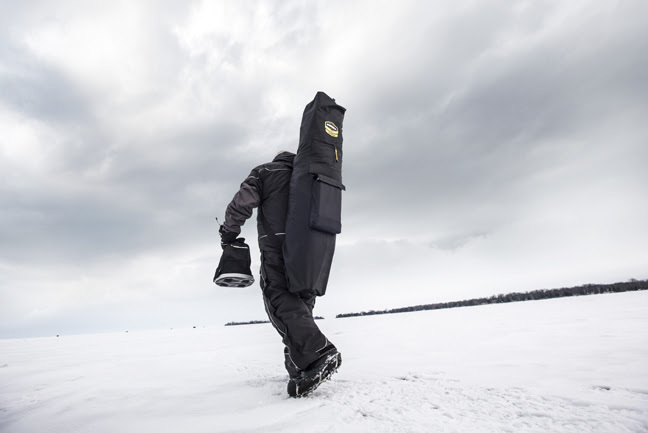 These anglers are taking the ice-fishing game to an entirely new level. Besides safety, human comfort in a potentially unforgiving environment can be a huge issue, especially for those that are new to the game. Ice houses, shanties, shacks, shelters – call them what you want, but anybody who spends a good amount of time on the ice needs protection from the elements. 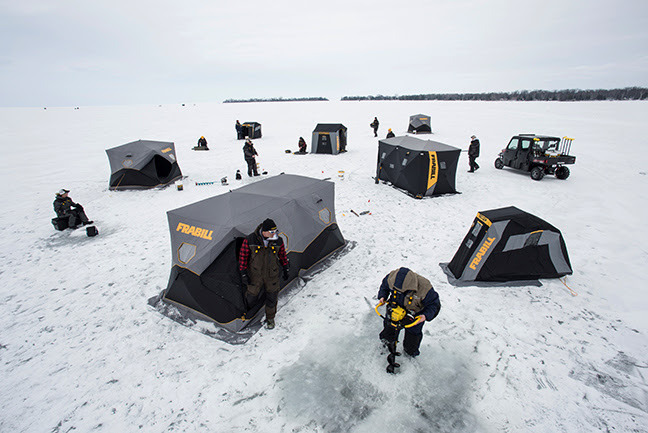 Frabill might not have invented the portable ice fishing shelter, but they clearly took the lead in quality and innovation. Permanent fishhouses are the stuff of legend, and the new generation of “wheeled-houses” are something to behold. Some are comparable to an on-ice RV with all the creature comforts: Kitchenette, bathroom, satellite TV, queen-size bunks, and a big cushy sofa sure make life easier when the fish aren’t biting. But, for the majority of ice anglers, spending tens of thousands of dollars on one is not in the cards. Not to worry, there are portable shelters available to fit any budget and you don’t need a three-quarter ton pickup to move ‘em. The market is overflowing with portable ice shelter options. Given so many choices, it’s a lot easier to select a shelter when a few things are taken into consideration. For example, do you plan on fishing solo or with family and friends? Do you have to walk out on the ice and haul your gear, or will motorized transportation be used? And, what type of conditions do you typically fish in – extreme cold or moderate temperatures? Enormousness best describes Frabill’s fully-insulated Bunker 450 Hub ice shelter. With 89 fishing sq. ft. on the inside, there’s space for a family’s worth of gear, the dog, and plenty of holes to jig in. Portable ice shelters seem fairly simple, consisting of fabric that surrounds a frame allowing the occupants to stay in a warmer environment out of the wind and precipitation and potentially have a better view of what’s below the hole (…more on that in a bit). But, when it comes to ice shelters, beauty is often only skin deep. The best models are built with advanced materials that are carefully selected for their durability in extreme environments, architeched with intelligence and hundreds of hours of testing, and are light enough for easy transport and stowing. And of course, longevity, given proper care. 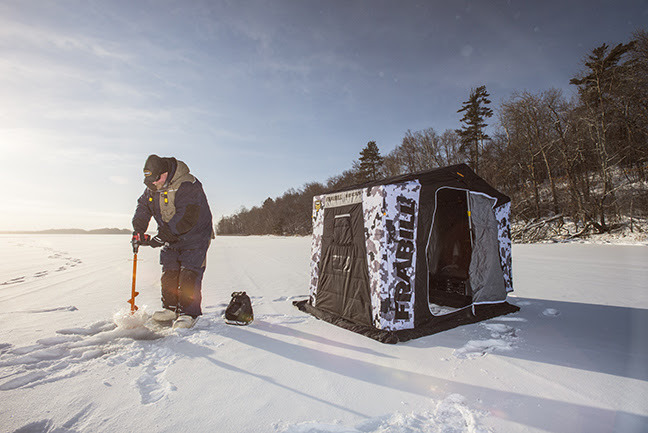 Minnesota fishing guide Brian “Bro” Brosdahl is big on hub-style portable fishhouses for their quick set-up, generous fishable space, and providing clients with a warm, comfortable on-ice experience. “One of my favorite houses is the Frabill Bro Series Hub, which I designed to easily accommodate two or three big dudes. With over 44-feet of fishable space, there’s loads of space for gear as well. The Bro Series Hub is insulated for ultimate warmth and doesn’t make a racket in the wind. Plus, its manageable at only 36-pounds and fits in an included bag with shoulder straps and takes up minimal space in your vehicle. Keep it behind your seat or nestled under the topper as a stow-and-go house to hit the ice on a whim. 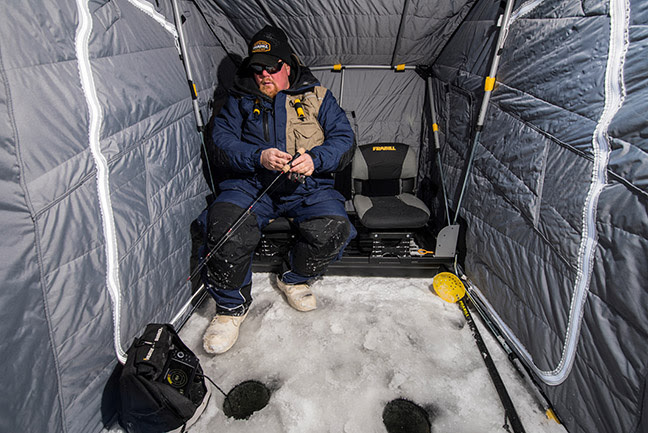 Despite its meaty 80″L x 80″W x 80″H dimensions, the 2-3 angler Bro Series Hub ice shelter packs and transports with ease. “And the winter camo pattern just looks cool,” says Brosdahl. Some anglers will purchase a couple Bro Series Hubs – one to fish out of, and one to use as a cooking shack or latrine. Anglers with small kids will often set up a second hub for kids to play in, no hole-drilling required. 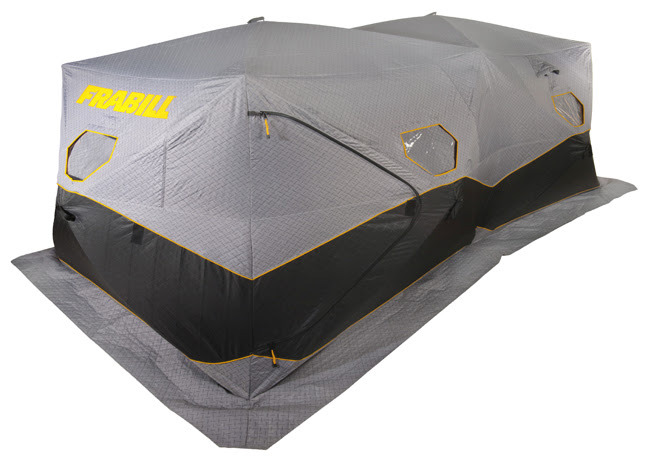 For larger families or groups who want to fish under the same roof, Bro recommends Frabill’s fully-insulated Bunker 450 Hub Ice Shelter, which provides a massive 89-square feet of space for gear, holes, and bodies. Flip-overs, on the other hand, are designed for serious running and gunning — 15 minutes here, 5 minutes there, the routine of anglers constantly on the search for fish — typically towing their shelter (or a convoy of shelters) behind a snowmobile, ATV, or side-by-side. But there are many lightweight sled-based flip-over style shelters, too, that make fishing-on-foot easy. Ice fishing expert Cory Schmidt never hits the ice without a flip-over, whether he’s pulling it behind his tricked-out Honda ATV or hoofing it onto early or late ice. The Frabill Recon is a sleek, quick deploying one-man wrecking machine. 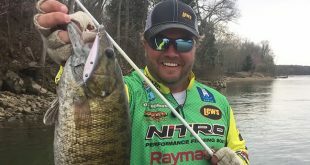 “I mostly fish out of a Frabill Recon one-man shelter.. One of the coolest angles with these smaller one-man flip-overs is they provide a smaller and darker space for sight fishing. Block out all the light around the windows and floor and make it as dark as possible within. Especially for trout or panfish in clear, shallow water — sometimes for walleyes, too — it’s really fun to cut a rectangular sight-hole with an ice saw or a series of augered holes and hunker above the ‘peer-hole,’ studying and reacting to the actions of incoming fish. “A lot of times, we’ll jig rainbow trout right up to within a foot of the surface, set the hook and have a crazy fish splashing and flopping around right at your boots. We’ll even use landing nets at times to dip bigger fish,” says Schmidt. 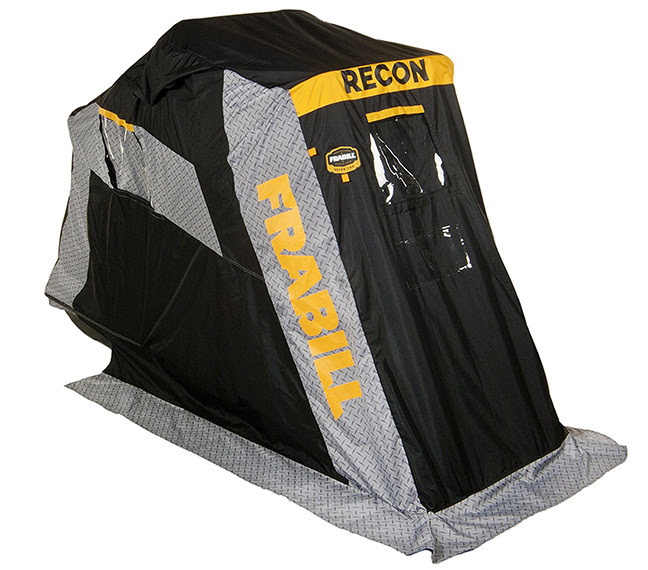 Frabill’s SideStep feature is the most innovative portable shelter feature in over a decade. Frabill’s proprietary SideStep shelters combine a sled-based flip-over design with increased headroom and intelligent side entry points, versus the front door access found in most flip-over shacks. 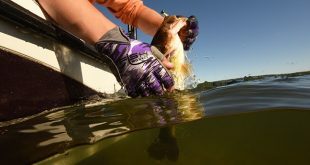 When Brosdahl and his wife, Heather, get the chance to fish together, he says it’s typically out of a Frabill SideStep. “Two side doors seem so simple, but what a bonus it is to step out to the side instead of stepping over fishing holes, electronics and heater! With a door on each side, I’m able to step in and out at any time without disturbing the whole set-up or Heather,” says Brosdahl. Bro’s namesake SideStep puts his wishlist of features in one super-premium flip-over shelter. Regardless of the right style (or styles) shack for you, the next step is determining whether to choose insulated of non-insulated fabric. Of course, there are always exceptions. Anglers fishing in the southern reaches of the Ice Belt may never need an insulated shack, especially if they own a reliable heater for days when they do need additional warmth. Some of these same anglers may only fish on foot, too, so weight may play a bigger part in portable fishhouse choice. 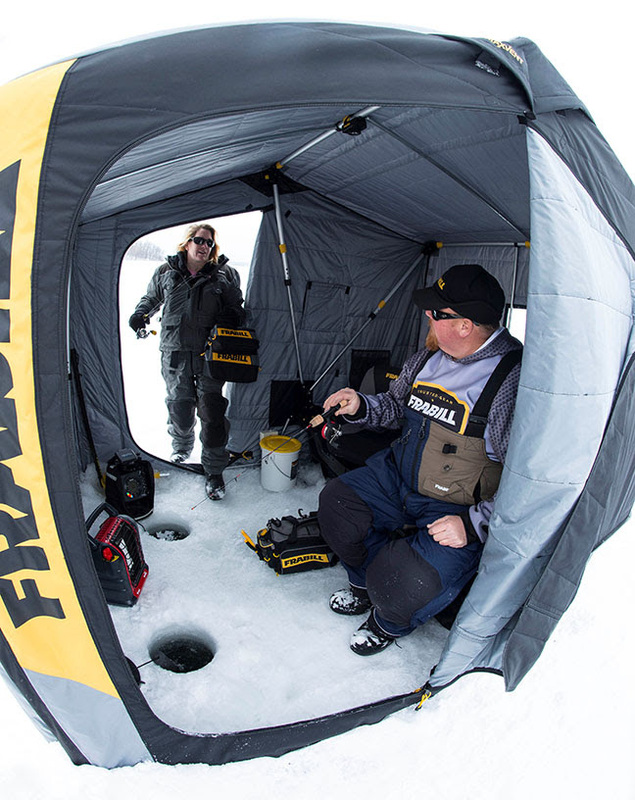 Regardless of what you need in a portable fishhouse, Frabill has a model that will keep you warmand mobile.